TV show dates: June 18,2 012 — present. Performers include: Omar Gooding, Angell Conwell, Bentley Kyle Evans Jr., Jayla Calhoun, Clayton Thomas, Tanjareeen Thomas, Paula Jai Parker, Rodney Perry, Judyann Elder, Richard Gant, Chris Williams, and Erica Shaffer. 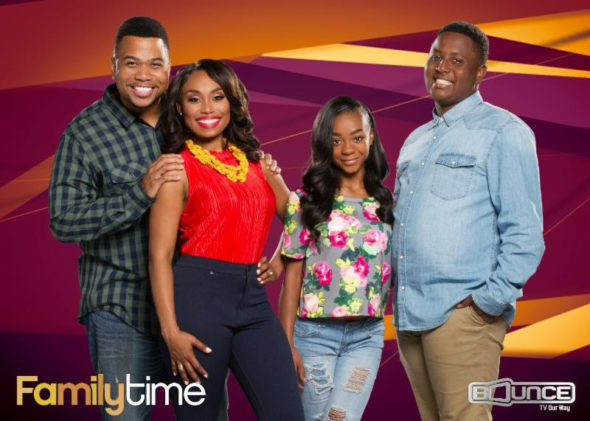 A family sitcom, the Family Time TV show was created by Bentley Kyle Evans. When working class couple, Tony (Gooding) and Lisa (Conwell) Stallworth, hit the lottery, the winnings propel these former high school sweethearts into the middle class. Tony and Lisa decide to use the windfall to move to the suburbs with their children, Devin (Evans) and Ebony (Calhoun). Despite the payday, Tony is still a struggling general contractor. While he and Lisa love each other, they are inclined to quarrel. Still, their squabbles don’t keep them from keeping an eye on their impish kids. From their romantic lives to school performance and future aspirations, Tony and Lisa stay atop of what’s going on in Devin and Ebony’s lives. These parents are determined their kids will make choices now which will serve them in the future. What do you think? Do you like the Family Time TV series? Should this TV show be cancelled or renewed for another season on Bounce TV? I love Family Time and I believe the show was just hitting its stride! Please, please, please do not cancel this show. I’m from Philly and I know that in my area it’s a very popular show.